I baked a chocolate cake in a 3D car cake pan. I cut it into a shape of a 34 Ford. I sliced it and filled it with chocolate buttercream. I covered the whole cake with a light cover of regular buttercream. I mixed my red color and used a and used a 16 tip for the stars all over the cake. I made all the decors with fondant. 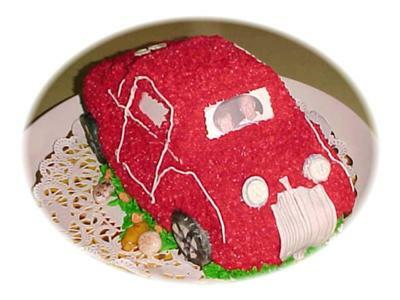 The tires are cookies covered with fondant, the lights are fondant and also the grill. The rocks are candy rocks on the ground around the cake. The grass is grass or fur tip. The little poppies are fondant. Nancy, you know I love it!!!!!!!! I really like the picture too!!!!! !